Castleford Tigers coach Daryl Powell believes both the club’s wingers Greg Eden and Greg Minikin could be pushing for England World Cup spots by the end of the season. Said Powell: “There will be a few options for England, there’s some really good wingers but if these two guys keep doing what they’re doing, they could be in with a shout. England coach Wayne Bennett is keeping tabs on his former Brisbane player Eden after changing his opinion of the Tigers winger. The 26-year-old was signed by the Broncos before the return of Bennett for his second spell with the Queensland club just over two years ago, where he spent the entire 2015 season with feeder club Wynnum Manly. Eden, who began his Super League career with home-town club Castleford in 2011 before moving on to Huddersfield and Hull KR, eventually made his Brisbane debut under Bennett in the World Club Series against Wigan just over 12 months ago but went on to make just six other appearances before calling a halt to his NRL career. “I’ve spoken to Wayne Bennett a few times and he’s always asked me how Greg Eden is going,” said Powell. 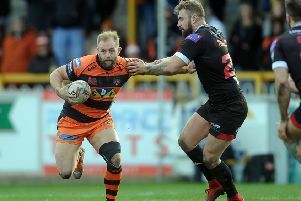 Eden, a full-back once dubbed England’s Billy Slater by then Huddersfield coach Nathan Brown, has demonstrated defensive solidity on the wing for the Tigers and showed his tremendous finishing ability to top the Super League tryscoring chart alongside team-mate Greg Minikin. Powell was especially impressed by Eden’s remarkable finish from centre Michael Shenton’s flick pass during his side’s 34-0 win at Widnes last Sunday. “I do not know how he reeled in that pass from above his head last week, it was just ridiculous,” Powell added. “His finishing has been great. He’s ridiculously skilful. People always talk about the other side of him but he’s not done anything much wrong with us. He’s lightning quick and strong and he’s a real competitor.